Although mini in size, these mini size binder pockets have proved to offer large organizational benefits. A smaller version of C-Line's current offering, the binder pocket has a hook and loop closure to secure loose items inside, while having the ability to expand up to 1/2 inch in size to increase capacity. 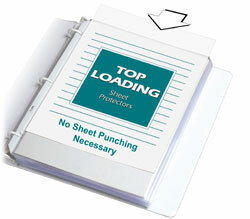 The side loading pocket is prepunched, which allows it to fit into standard 3-ring 5 1/2 x 8 1/2, 6 x 9, and 8 1/2 x 11 binders. On-the-go organization is easy with C-Line's document storage additions! Note: If using a day planner, please check the actual product dimensions and hole punch configuration; does not work with all day planner systems.